The little girl loved her mother. She was only 12 days old when she first smiled up into her face, though it was her mother, and not the baby, who remembered this. You don’t remember much at 12 days old! She was only 2 months old when she was separated from her mother. The baby needed to go and live with a woman named Rose, who could feed her because her mother was not able to. The little girl lived 13 months with Rose before she came home to her own mother, her father and her sisters. By then it was hard to say goodbye to Rose. That is a lot of goodbyes! So, although she was happy as a toddler, she did cry if she was separated from her mom. Wouldn’t you? When she was 4 and a half years old, her mother died. One never gets over that sort of goodbye, though her older sister Pauline, who was 16, did all that she could to be a new mother to the little girl, who, nonetheless, became a little shy. Wouldn’t you? People who are very sad do not like to hear about promises that cannot be kept. The little girl loved everyone in her family, especially her papa and Pauline. Once, she told her older sister that she would like to go off to a desert and live with her, and Pauline said that she would like that, too. But when she was 9 years old, the girl learned that Pauline was leaving for a kind of desert—and without her little sister! Pauline was going to enter a Carmel, become a religious sister, and live her life centered upon Jesus alone. The little girl begged to go along. It is so hard to say goodbye to someone whom you love! Thomas had the same trouble. He had loved the Lord Jesus. Thomas had believed that everything in the world was going to get better because of Jesus, but then Jesus died upon a terrible cross. Thomas became more than shy. He got scared, and he began to doubt that there was anything good about this world. That kind of fear happens to all of us, once in awhile. When his friends told him that they had seen Jesus, he couldn’t—he wouldn’t—believe them. People who are very sad do not like to hear about promises that cannot be kept. 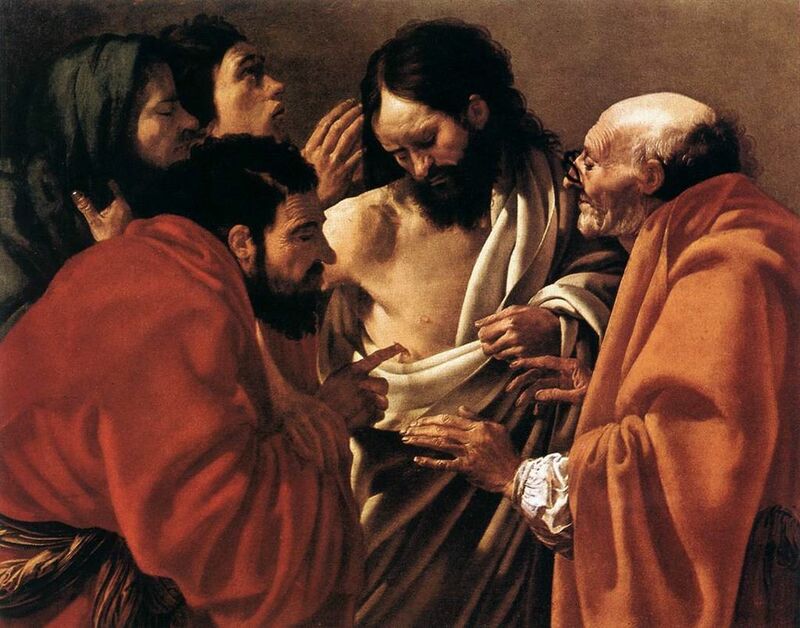 Thomas said that he would not trust them, not without seeing where the nails had been driven into Jesus and touching the spot where Jesus had been pierced by a sword. To love someone and to promise not to leave them is the very meaning of mercy, and Thomas knew that he had found this in Jesus. On the day of her first holy Communion, the family of the little girl noticed that she was crying, and they worried that the tears were because her mother was not there to share in the joy of her daughter receiving the Lord Jesus. But the little girl, whose name was Thérèse, said that she was crying happy, not sad, tears. Tears sometimes come when we are too happy. How could Thérèse be that happy? Here is what she said. [T]he joy of Heaven having entered my heart, this exiled heart was unable to bear it without shedding tears. Oh! No, the absence of Mama didn’t cause me any sorrow on the day of my First Communion. Wasn’t Heaven itself in my soul, and hadn’t Mama taken her place there a long time ago? Thus in receiving Jesus’ visit, I received also Mama’s. She blessed me and rejoiced at my happiness. I was not crying because of Pauline’s absence. I would have been happy to see her by my side, but for a long time I had accepted my sacrifice of her. On that day, joy alone filled my heart and I united myself to her who gave herself irrevocably to him who gave Himself so lovingly to me! The Gospel’s Easter promise: Love will win out over sin and death. ‘Doubting Thomas’ is an unfair label for someone so much like ourselves. Easter time is a wonderful time to celebrate first holy Communions because in them Jesus is still busy with the mercy that he showed to St. Thomas and St. Thérèse. In the Eucharist, in receiving holy Communion, we are able to see Jesus, to touch Jesus, to receive Jesus into ourselves, though to do this we must have faith. If we have faith, like Thomas and Thérèse did, we learn from Jesus that to love someone is to promise never to leave them. That is the meaning of mercy, and the only person who can promise that much mercy is Jesus. Holy, Holy, Wholly, from start to finish, the Thomas, Therese and Jesus, encounters! Telling how Thomas and Therese touched Jesus and He, them, was also for me a touching experience. Good job Father Klein! Like Thomas, Therese too, in touch with the Resurrected Body of Jesus in Eucharistic Holy Communion, the same Resurrected Body Blood, Soul and Divinity encapsulated for her in the Mystery that is God, in transubstantiated materiality, precisely in that form of the Mystery that is God, The Great “I Am” reclining comfortably as we would at home, which in Eucharist Jesus surely is, sharing His entire Self Body, Blood, Soul, Divinity, with transubstantiated materiality. Asking “How?” is unanswerable, asking “Why?” The answer is because “God is Love” and as every lover knows, love, loves to be shared! In Eucharist God shares Himself, as those who know, know. Because God, I mean Jesus, is an Equal Opportunity Provider and loves to share, everyone has the opportunity to encounter the Lord. Allow me to tell briefly of a personal one. It happened during the Spiritual Communion of prayer, a Communion during which I kept falling asleep, having decided to spend some quiet time with Jesus in the Blessed Sacrament, on my way to work at my Parish rectory. I positioned myself as close to the tabernacle as I could get and sat there falling asleep! So as to stay awake, I decided to focus on the Tabernacle Door, imaginatively trying to open it, but I still kept dozing off. Unexpectedly in a sleepy state I imagined hearing the invitation, “Come on in!” Somehow in a half awake condition I must have imagined it was Jesus, so I said, “Where, Lord?” The response was immediate, “In the Tabernacle with Me!” Suddenly I was wide awake and understood instantly what I had heard imaginatively . It was a message from Jesus delivered by way of imagination very active in me, offering Spiritual Communion, friendship, encounter. Wonderful to relate I knew right away it wasn’t just about me – Jesus wants everyone to be His friend and He wants to be everybody’s friend too. A memorable encounter clearly remembered decades later. Again Father Klein, thank you! The Rev. Terrance Klein is a priest serving in the Diocese of Dodge City and author of Vanity Faith.